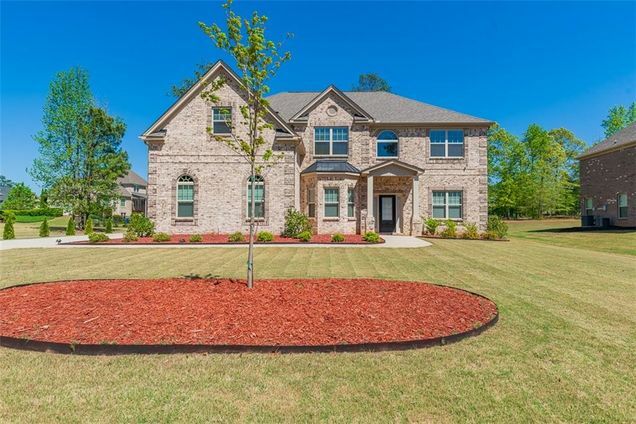 This stunning two-story home is located on the 17th hole of the golf course. Beautiful hard wood floors on the main level and plenty of natural light flow throughout the homes open, airy layout. Enjoy gatherings in the generously sized living/dining area grazed by a fireplace. The gourmet kitchen will inspire your inner chef with its granite counters, center island, and stainless steel appliances. The extended patio with a Pergola onlooking a huge backyard is perfect for hosting summer cookouts. Great neighborhood minutes away from schools, shopping, and restaurants. Take I-75 S to exit 221 make a right on Jonesboro Rd. In 2 miles make a left on Mt. Carmel. In a 1/2 of a mile make a right on Crystal Lake. Once through the gate make a left in 0.2 miles on Peninsula Overlook. The home is located on the left side. Hello, I’m interested in 709 Peninsula Overlook and would like to take a look around. The details on 709 Peninsula Overlook: This house located in Crystal Lake Golf and Country Club, GA 30228 is currently for sale for $445,500. 709 Peninsula Overlook is a house with 5 beds and 4 baths that has been on Estately for 6 days. 709 Peninsula Overlook is in the Crystal Lake Golf and Country Club neighborhood of Hampton. This house is in the attendance area of Dutchtown Elementary School, Dutchtown High School, and Dutchtown Middle School.